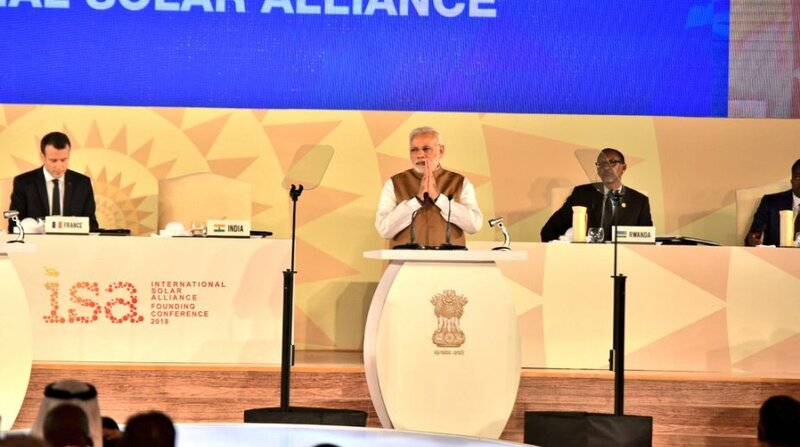 Prime Minister Narendra Modi and French President Emmanuel Macron inaugurated the first International Solar Alliance (ISA) Summit on Sunday at the Rashtrapati Bhavan Cultural Centre. The two leaders and other heads of participating nations placed their hands on illuminated globes to mark the symbolic launch of the Summit. Both Macron and PM Modi addressed the plenary session of the Summit. Thanking France for playing a “major role” in the growth of the ISA, PM Modi said that the seed of the idea was planted in Paris in November 2015. He said that of the 121 countries which the ISA aims to cover, 61 have joined the alliance and 32 have ratified framework agreement. “We have to come out of our personal boundaries and work like a family for the benefit of humanity,” said the PM urging nations to come together on the issue of climate change and renewable energy. “The growth and use of solar energy will certainly reduce carbon from earth,” the PM told the gathering. He also asked the Alliance to pay attention to the fact that while some nations get a lot of sunlight but don’t have the required technology to trap that energy there are others, particularly islands, which are directly threatened due to climate change. “The greatest friend of this alliance is Lord Sun,” said the PM while highlighting India’s ancient scientific knowledge about Sun. “Every ancient civilisation has credited Sun for nurturing the planet but India gave it utmost importance. The Vedas extolled the Sun as the soul of the world ages ago,” the PM said urging the members to draw lessons from India’s ancient knowledge as they try to find a way to fight climate change. The PM also pointed out the various measures, plans and policies undertaken by his government in taking India towards renewable energy. 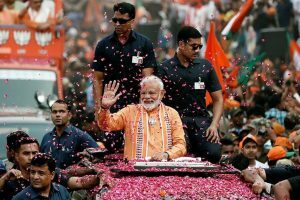 “India will produce 175 GW electricity from renewable sources by 2022 of which 100 GW will be solar,” he said while underlining that India has already achieved 20 GW installed capacity solar power. He said that shifting to solar energy also translates into benefits in many areas such as savings citing the example of how India saved $2 billion and 4 GW of electricity by distribution of 28 crore LED bulbs in three years. The PM said that India will provide 500 training slots for ISA member countries and start a solar tech mission to lead R&D in the sector. He also listed out 10 action points calling for concessional financing, framing regulations, and affordable technology among other things to raise share of solar electricity in energy mix. In his address, Macron said that both India and France are committed and have an equal desire to create momentum and inspire people towards the goal. Besides the heads of 23 nations, 10 ministerial representatives of different countries attended the Summit. Also in attendance were several global bankers.